Devil Fruit is a 70/30 indica dominant feminized Marijuana strain. Smooth indica effect with a quite late flowering period but with an very sweet and pleasant taste. 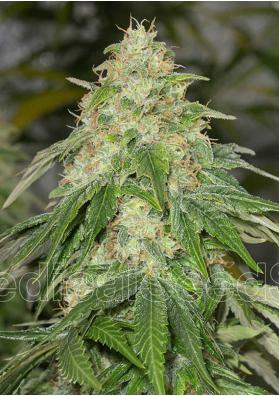 Devil Fruit is a indica dominant feminized hybrid Marijuana strain created by crossing two cannabis classics: Shiskaberry and Great White Shark. Its effects are heavily influenced by its indica heritage, the high starts with a smooth cerebral buzz but soon gives way to a pleasant relaxed feeling without too much heaviness, inspiring creativity yet allowing ability to function. Devil Fruit stands out for its delicious sweet and pleasant taste, a real delight for the palate created by the devil to seduce you. Although the plant develops a robust indica appearance, its quite late flowering period is a consequence of its sativa traits. Medical Seeds recommends growing Devil Fruit in a position with full light exposure to avoid the production of too many leaves at expense of flowers. Devil Fruit needs a vegetative period of 2-3 weeksand a flowering period of 65-70 days. After that time you will be able to collect 500 grams per square meter, as long as the plant has sufficient light. In the outside, the plant can reach a height of 2.5m and it will be ready to harvest in early October (northern hemisphere) with high productions.